Review: One tagline for SULLY is “The untold story behind the miracle on the Hudson” and many may wonder if the story is worth being told. We all know of the unprecedented landing but what happened afterwards is what makes the movie riveting. Chesley “Sully” Sullenberger (Tom Hanks) is a seasoned pilot of over four decades. His calm, split second decision making made him a hero of New York and the world. But afterwards there were plenty of “suits” trying their best to overlook the miracle and find fault in the method. In the wake of climbing out of the Hudson Sully finds himself having to defend his actions to try and salvage his stellar career. It is frustrating to watch a company attempt to dismantle what the rest of the world is applauding. The story line is not manipulative and screenwriter Todd Komarnicki adapts the biography well. The facts are intriguing enough without unneeded embellishments. Director Clint Eastwood then takes that script and pieces together a powerful narrative of emotion and action. Hanks may not stray too far from his comfort zone but none the less we feel for Sully and hang on every moment. Many smart film making sets this apart from other airline dramas. For one Eastwood waits until you are comfortable with the characters before offering the intensity of the crash. The disaster event doesn’t take a backseat but it also does not overshadow the man and the aftermath of inquiries. Secondly he allows his actors to breath and move organically. The dialogue is never rushed through or glazed over. It happens naturally. Aaron Eckhart stars as Sully’s co-pilot Jeff Skiles. Eckhart is a fantastic partner for Hanks and the two work brilliantly together. The rest of the cast (Mike O’Malley, Laura Linney, Anna Gunn) deliver emotional performances that could win them a best ensemble nod once award season roles around. 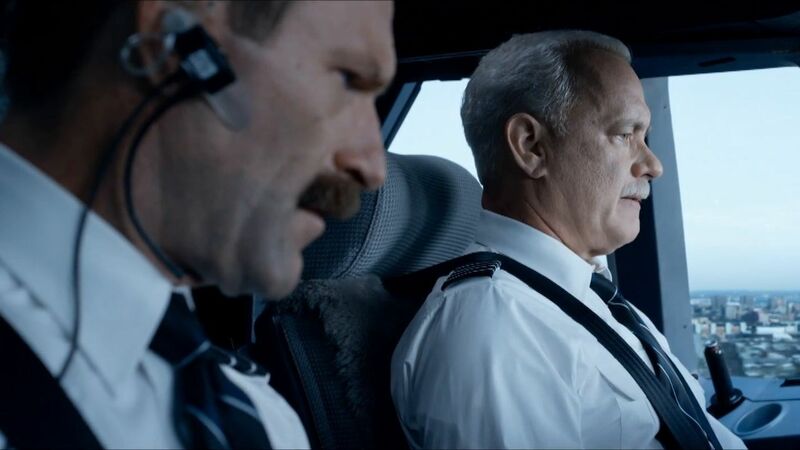 SULLY is rated PG-13 for some peril and brief strong language. It is an adult film in its themes and pacing but those older teens could find it interesting too. I give it 3.75 out of 5 mustaches. I wasn’t sure if the story needed telling or if I would find it worth hearing. But thanks to Eastwood and his cast the story may become the most surprising film of the season.